The former Soil Conservation Authority began an inventory of Victoria's lands in the 1950's, led by R.G Downes who saw the need to include data on land characteristics and processes in planning land use and management. 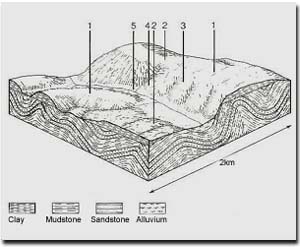 The Land Systems method was subsequently developed, with Frank Gibbons, Jim Rowan and Ken Rowe (amongst others) prominent in its application. The resultant studies identify Land Systems and their land components. These studies provide information on factors affecting production, susceptibility to processes of soil degradation, and land management. The Land Systems method involves an ecological approach - integrating environmental features often mapped singly, eg. rainfall, geology, topography, soils and indigenous vegetation. Patterns occur, governed by climate, geology and landform, which interact over time to influence the distribution of soils and vegetation. A Land System is therefore a complex mapping unit that contains a pattern of land components each of which has little variation in climate, lithology (rock type), landform, soil and indigenous vegetation. The land component can therefore be regarded as a unit of management for broad-scale uses such as dryland farming or forestry. Land System surveys have generally resulted in maps at 1:100 000 to 1:250 000 scale being produced. Many of these published studies describe (but do not map) the individual components of each Land System. A consistent statewide coverage of Land Systems (at 1:250 000 scale) was developed by Jim Rowan (1990) and has subsequently been updated with new information. A number of Land System survey reports will be made available on this site over time as downloadable reports. The list of reports and links to downloadable documents (where currently available on this website) can be accessed from the References page. An enhanced Land Systems (version 3) mapping and information framework (1:250 000) for Victoria was finalised in 2000 (Rees 2000). This builds on the existing Land Systems of Victoria (version 2) by Rowan (1990). Revision was achieved by using more recently acquired soil and land information (e.g. West Wimmera), and utilising techniques such as radiometrics interpretation and digital elevation modelling. Key activities included redefinition of the Land System Key and nomenclature. A number of large soil/landform studies at a scale of 1:100 000 (i.e. West Gippsland, Glenelg-Hopkins, Goulburn broken and Corangamite CMA regions) have since been completed and will provide a basis for future Statewide Land Systems updating, should funding be made available to integrate them. This key map provides a means to click onto 1:250 000 mapsheets across Victoria to download a printable pdf version of Land System mapping according to Rees (2000). Further information on the history of Land Systems mapping in Victoria is provided on this website. Rowan, J. (1990). Land Systems of Victoria. Department of Conservation and Environment and Land Conservation Council.